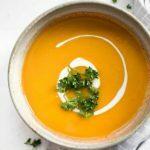 This soup recipe is really simple, you only need a few ingredients and can get all of them in the supermarket. Perfect for when you need some nourishing and healthy food on Thanksgiving Day. Place all ingredients in the crockpot and mix. Cook for 3 hours on high. Use a hand blender, blender, or food processor and puree mixture untilsmooth.